Asp.Net Web API 2 has been released with the release of Asp.Net MVC 5 since 5 months ago, Web API 2 can be used with .NET framework 4.5 only, the Web API 2 template is available by default on VS 2013 and you can install Web Tools 2013.1 for VS 2012 to have this template as well by visiting this link. In my previous tutorial on Building ASP.Net Web API RESTful service, I’ve covered different features of the first release of ASP.Net Web API, in this two series post (part 2 can be found here) I will focus on the main features in version 2, I’ll be using the same project I’ve used in the previous tutorial but I will start new Web API 2 project then we’ll implement and discuss the new features. The source code for the new Web API 2 project can be found on my GitHub repository. Note: I will not upgrade the existing eLearning Web API to version 2, but if you are interested to know how to upgrade version 1 to version 2 then you can follow the steps in ASP.Net official post here. 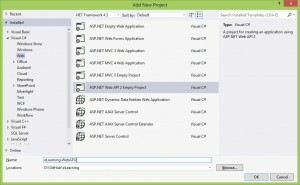 What is new in ASP.Net Web API 2? Web API 2 now supports attribute routing along with the conventional based routing where we used to define a route per controller inside “WebApiConfig.cs” class. Using attribute routing is very useful in situation that we have a single controller which is responsible for multiple actions, with version 2 the routes now can be defined directly on the controller or at the action level. In the first version of Asp.Net Web API we always returned HTTP response messages for all HTTP verbs using the extension method Request.CreateResponse and this was really easy, now with version 2 of ASP.Net Web API this is simplified more by introducing a new interface named IHttpActionResult, this interface acts like a factory for HttpResponseMessage with a support for custom responses such as (Ok, BadRequest,Notfound, Unauthorized, etc…). Note: I’ll not cover this in the current post as I’m planing to do dedicated series of posts on oData support for ASP.Net Web API. Multi part series tutorial for Building OData Service using ASP.Net Web API is published now. As stated before and to keep things simple we’ll depend on my previous tutorial eLearning API concepts to demonstrate those features. All we want to use from the eLearning API is its data access layer and database model, as well the same repository pattern, in other words w’ll use only project eLearning.Data, if you are interested to know how we built the eLearning.Data project then you can follow along on how we created the database model here and how we applied the repository pattern here. Once you have your database access layer project ready then you can follow along with me to create new eLearning.WebAPI2 project to demonstrate those new features. I will assume that you have Web Tools 2013.1 for VS 2012 installed on your machine, so you can use the ASP.NetWeb API 2 template directly which will add the needed assemblies for ASP.Net Web API2. 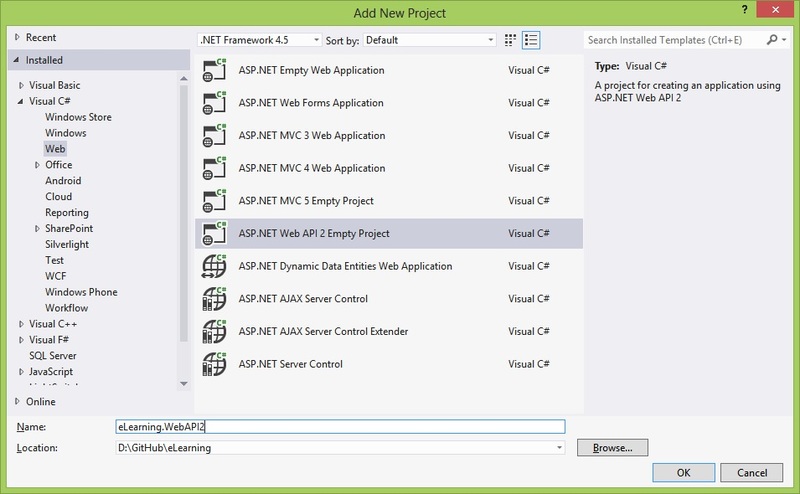 We’ll start by creating a new empty ASP.Net Web API 2 project as the image below, you can name your project “eLearning.WebAPI2”, do not forget to choose .NET framework 4.5 version. Once The project is added we need install Entity Framework version 6 using NuGet package manager or NuGet package console, the package we’ll install is named “EntityFramework“. When the package is installed, we need to add a reference for the class library “eLearning.Data” which will act as our database repository. The ASP.Net Web API 2 template we used has by default a class named “WebApiConfig” inside the “App_Start” folder, when you open this class you will notice that there is new line config.MapHttpAttributeRoutes(); this didn’t exists in Web API version one, the main responsbility for this line of code is to enable Attribute Routing feature in Web API version 2 where we can define routes on the controller directly. In this tutorial we want to use routing by attributes only to route all requests, so feel free to delete the default route named “DefaultApi”. The other important change introduced in Web API 2 is how the “WebApiConfig” file is registered, go ahead and open class “Global.asax” and you will notice that there is new line used for configuring the routes GlobalConfiguration.Configure(WebApiConfig.Register); this line is responsible for registering the routes when the global configuration class is initiated and ready to be called. What we have done here is simple, if you look at the highlighted line of code above you will notice how we defined the route on action level by using attribute System.Web.Http.Route where we specified the request URI and stated that id parameter should be integer, if you tried to issue GET request to URI “/api/courses/abc” you will get 404 response. In the code above notice how we defined the route name on attribute level, you can not define route names on Controller level so if you have another actions need route names then you have to define them on each attribute. Now how we defined the routing attribute and prefixed it with “~” so Web API will route any HTTP GET request coming to the URI “api/subject/8/courses” to this route, this is really nice feature when you want to introduce exceptional routing in the same controller. In the next post I’ll cover the IHttpActionResult return type as well the support for CORS in ASP.Net Web API 2. Managed to follow and understand everything up to this bit, “ctx.Dispose()”. Where does the “Dispose” come from? It is coming from class System.Data.Entity.DbContext where “LearningContext” inherits from. I’m just disposing the database context. If you are wrapping it with “using” then no need to do this. Thanks for the the tutorial. In your previous post http://bitoftech.net/2013/12/16/asp-net-web-api-versioning-accept-header-query-string/ you explained how to do versioning by using the accept header and by overriding the DefaultHttpControllerSelector. Would this also work well with Web API 2 and would you still recommend this? At http://www.asp.net/web-api/overview/web-api-routing-and-actions/attribute-routing-in-web-api-2 Mike Wasson mentioned (not explicit recommend) to use the “/api/v1/resource” / “/api/v2/resource” pattern. And obviously this could be implemented very easy with attribute routing. I tried it out and unfortunately your priviously mentioned example of versioning by using the accept header and by overriding the DefaultHttpControllerSelector will not work with attribute routing in the form it is. Kiran Challa described who to handle this issue when using attribute routing. You are right it won’t work if you are using routing on attribute level, the controller selection will fail. localhost/api/myapi/GetMystuff/1/http://ww.google.com I get error Server Error in ‘/’ Application. How to handle this? If I were in your situation I won’t pass a URL in the API end point, I’ll treat it as a string (without http://) then once I receive the string I’ll construct the URI again, or you can use the URL passed as query string parameter not part of your API URI params. Will it cause problems if I use AttributeRouting, but leave the WebApiConfig routing in place? I am getting a 500 error indicating after I implement AttributeRouting at the controller “Multiple actions were found that match the request”. Hi Andy, it should not cause issues, usually you will use WebApiConfig routing as a catch all route for your requests. I’m not a fan of mixing both AttributeRouting and legacy routing, try to use AttributeRouting; IMHO I found it easier and better to manage than defining all the routes in single file. I’m using your code as a learning tool for web api and I’m trying to figure out how to bring back from the database. I’m getting the data that I am searching for but I am only getting one record when I should be getting thousands of records back. This displays one record with all the fields in my class when I should see hundreds of records. Any clues you guys could give me would be very helpful. Remove .FirstOrDefault() from method “GetAllProfessionalsListByProCode” and replace it with .ToList() and you should retrieve all the records. Good luck! I’ve download the sample code and tried to run it on my machine using VS2013 (I had to change IIS Express to IIS Local in the project’s settings to make it work first because I was getting a “403.14 – Forbidden” error). However, I get a 404 error when trying to get courses by id using http://localhost/eLearning.WebAPI2/Courses/1. What am I missing here? Hi, I do not think that URL you provided is correct (eLearning.WebApi2) please check the virtual path. As well for WebApi projects, receiving 403.14 as when you run it is normal. There is no home page for WebApi projects. Can attribute routing work with DI container (I am using autofac) in constructor injection mode? In my web api 2 project, if I use attribute routing, the controller can only be instantiated with a parameterless constructor and I have to use property injection. I’m not very familiar with AutoFac, sorry about this. Does attribute routing require a parameterless default constructor on the controller, such that it prevents using any dependency injection framework in constructor injection mode?